Brother and sister, Karen and Richard Carpenter started out in music early on. Richard was on piano and Karen was eventually on vocals, although her road to becoming a singer was a long and complicated one. At first, Karen started out playing the Glockenspiel which she hated. She eventually turned to drums and thought she found her calling, practicing rudiments and press rolls for hours on end. Karen was set on becoming a professional drummer. Although Karen played the drums on the Carpenters recordings, it was her singing that made the Carpenters siblings famous around the world. ‘(They Long To Be) Close To You’ was originally written by Burt Bacharach and Hal David. Initially released as ‘They Long To Be Close To You’ with Richard Chamberlain in ’63, the song didn’t do very well. Instead, the B-side ‘Blue Guitar’ became a hit! In 1964, Burt arranged the song for Dionne Warwick. This time releasing the song as a B-side to ‘Here I Am’. The song didn’t do well in the charts so Burt released his own version in 1968 which didn’t work either! 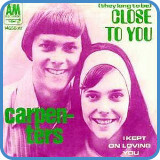 In 1970, the Carpenters released their version, now entitled ‘(They Long To Be) Close To You’. This time, the song worked and even snatched a Grammy in favour of ‘Let It Be’ by The Beatles and ‘Bridge Over Troubled Water’ by Simon & Garfunkel. Following the success of ‘Close To You’, the Carpenters went on to sell more albums than any other act in the 70s. After a few failed attempts at the charts, the act finally got picked up by A&M Records who only took a year to sync and release ‘Close To You’. This release instantly brought the Carpenters worldwide fame. Over the next five years, the Carpenters toured heavily, sometimes achieving over two hundred shows in a year. Whilst on the surface all seemed well, a tired Karen slipped into depression and also developed Anorexia Nervosa (a little-known eating disorder at the time). Even though Karen was struggling with her eating disorder, the band continued to tour and promote their music heavily. Ultimately this was said to have led to Karen’s collapse at their parents’ house in Downey. As Richard arrived the next morning, Karen had suffered a cardiac arrest and sadly passed away at only thirty-two years old. Since Karen’s death much more is known about the illness Anorexia and several celebrities have come forward about their problems with both Anorexia and Bulimia, one of the most famous being Diana, Princess of Wales. For complete lyrics, go to Close To You lyrics.